To make tart shell, cut butter into flour until crumbly. Add powdered sugar and egg yolks and mix just until dough comes together. If the mixture will not bind together, add 1 teaspoon cold water and mix. Only add 1 teaspoon water at a time and never more than 4 teaspoons water in total. Flatten dough into a disk and wrap in plastic wrap. Refrigerate for 1 hour. Prick dough all over with a fork to prevent it from rising and bake for 8 minutes. Remove from the oven, check for any holes or cracks and patch with reserved dough. Cool for 5 minutes. Brush base of tart shell with beaten egg whites to seal and bake 2 minutes longer. Remove from the oven and trim the edges with a sharp knife. Peel and core apples and cut into wedges. Cook in a frying pan over medium heat with ¼ cup of the granulated sugar until lightly caramelized. To make butterscotch sauce, heat ½ cup of the granulated sugar in a saucepan over medium heat, stirring gently until it caramelizes. Remove from heat and carefully add butter, stirring until it becomes a thick paste. Slowly add ¼ cup of the cream, mixing until it is the consistency of heavy cream. If the mixture doesn’t combine well, heat gently. Whisk together eggs, egg yolks, remaining ¼ cup granulated sugar, remaining ¾ cup cream, milk and a pinch of salt until smooth and fully combined. Reduce oven to 275°F. 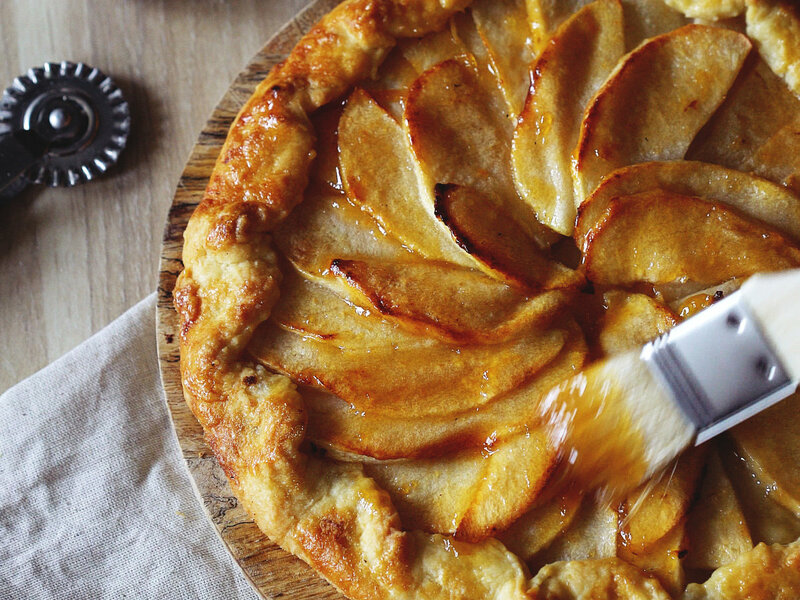 Pour egg mixture into tart shell, arrange apples on top and drizzle with half of the butterscotch sauce. To serve, use the remaining butterscotch to decorate the plate and drizzle over the slices of tart.